Fido has released a great new offer for those of you looking to sign up for or switch your home internet provider. 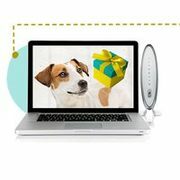 For a limited time you can sign up for any Fido Home Internet plan and get a $150 bill credit for free! The bill credit will be added to your account on your second or third monthly invoice. Plans start at $35 a month for Fido Internet 5 and go up to $65 a month for their top tier Fido Internet 75 which includes unlimited monthly downloading. Fido also offers a mid-tier option called Fido Internet 30 which costs $55 a month and also includes unlimited monthly downloading. All plans include a Wi-Fi modem and there is no contract required. A one-time $49.99 technician installation fee applies however the do itself option (which we recommend) is available free of cost to maximize your savings. The $150 bill credit offer is available until July 4th, 2017 for new activations only and eligible to all Ontario residents within Fido's service area. To receive this offer order online or call 1-888-236-FIDO (3436). Rogers is their parent company so they use the exact same lines. Amplifies calls up to 40 db. Slow talk mode. Visual alerts. East to see. Amplified cordless. 2 Handset. Speakerphone. Answering system. 3&4 Handset models available. 1 handset. 3.4" tilt display. 1 touch dial buttons. Power back up. Answering system.